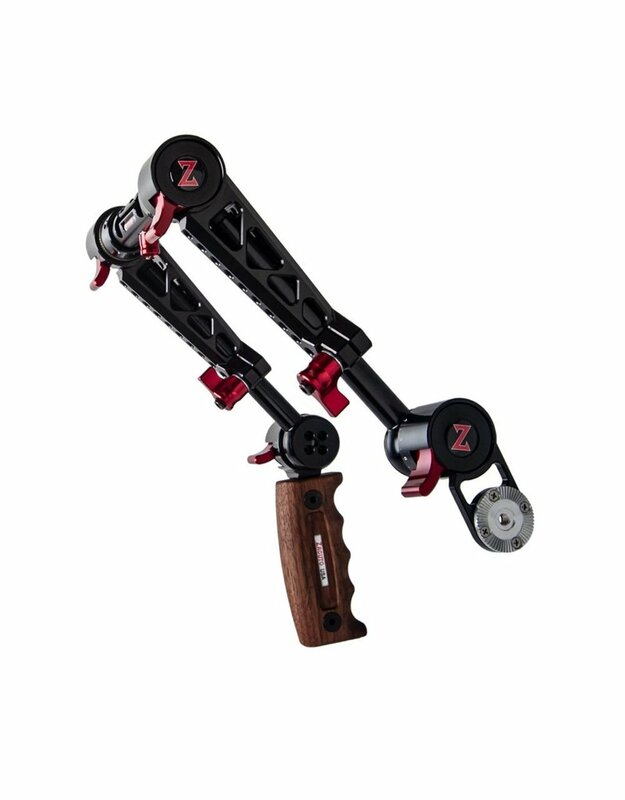 The C200 EVF Recoil Pro Rig with Dual Trigger Grips from Zacuto comprises a shoulder-mounted rig with dual, 360° rotating handgrips and an adjustable Recoil handle. 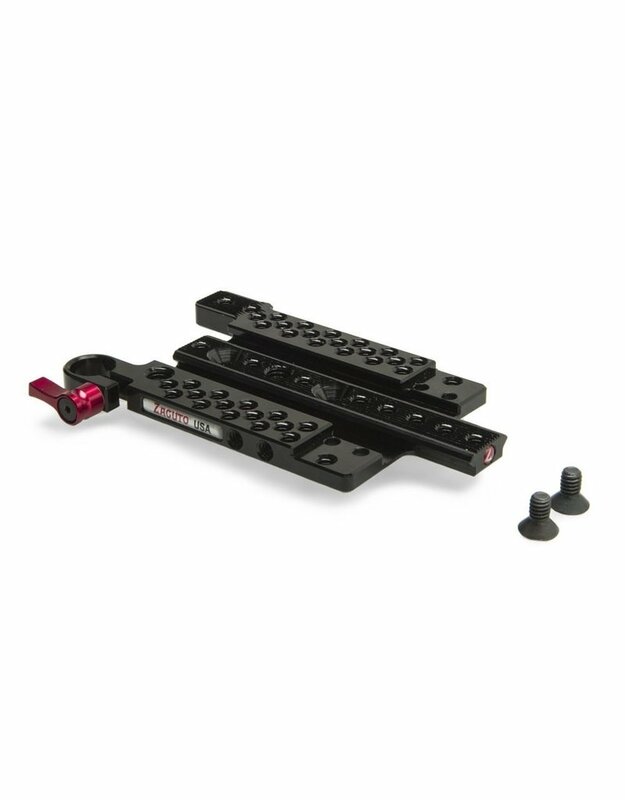 Additional components include the VCT Pro baseplate and the C200 Top Plate. The Rosette Dual Trigger Grips allow the attachment of a rosette-based camera / lens handle on one side and have a Wooden Handgrip on the other. 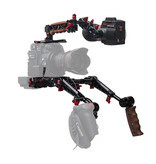 This allows a comfortable position for holding the shoulder rig. 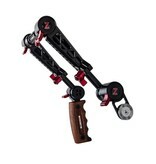 The Dual Trigger Grips are pushed onto 15 mm rods and allow a one-handed 360° rotation with a simple push of a button. 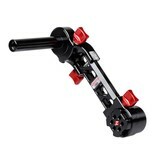 The two attached handles move independently of each other and are adjustable in length and orientation. 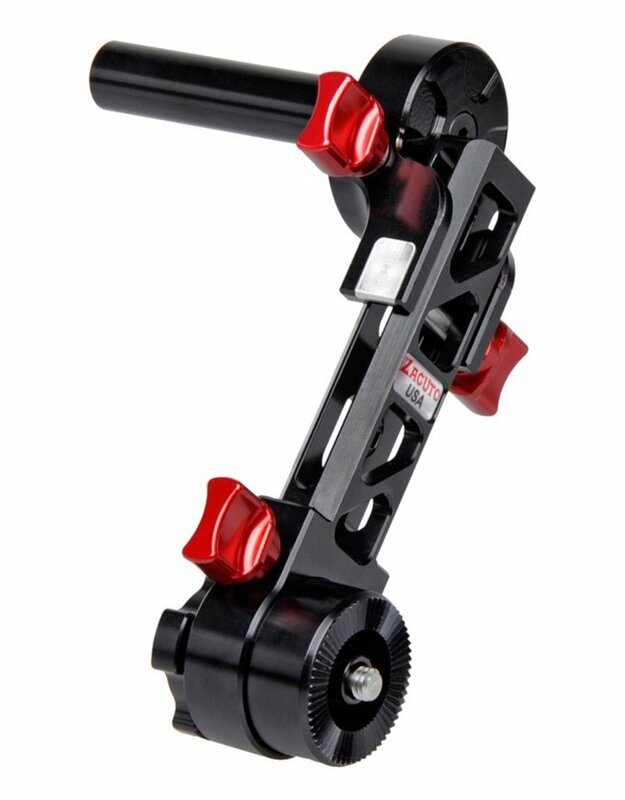 The Rosette Trigger Grip is especially compatible with the Canon C200, the Canon 18-80 lens handle, the Blackmagic URSA and the Panasonic Varicam LT. 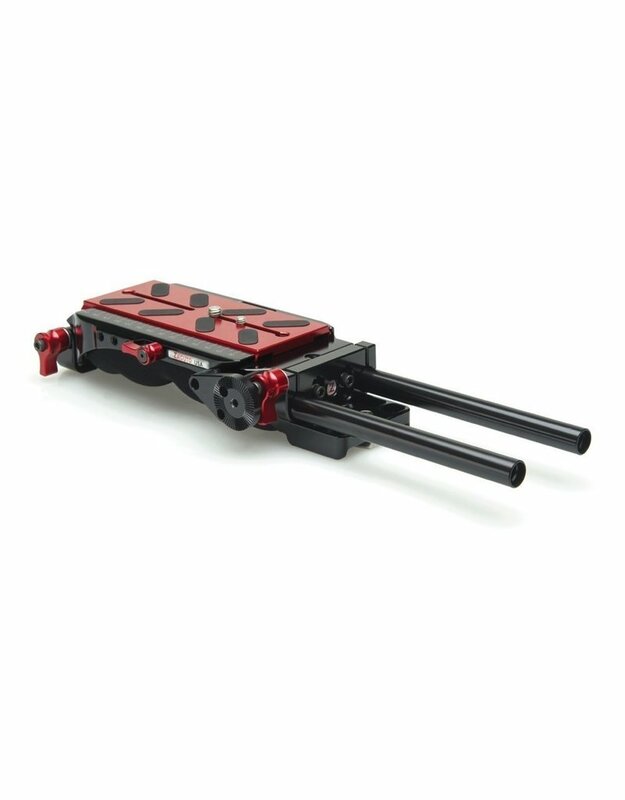 The C200 Top Plate has a built in Z-Rail perfect for adding the Recoil Handle. Or if desired, it is possible to reattach your Canon Handle to the plate. The top plate has a multitude of 1/4" 20 and 3/8" 16 screw holes for mounting various accessories. At the back of the plate is a 15 mm rod support for a Zamerican arm or other 15 mm accessory and a grooved mount for the Canon C200 LCD. The Canon LCD can also mount to the built in Z-Rail if needed. 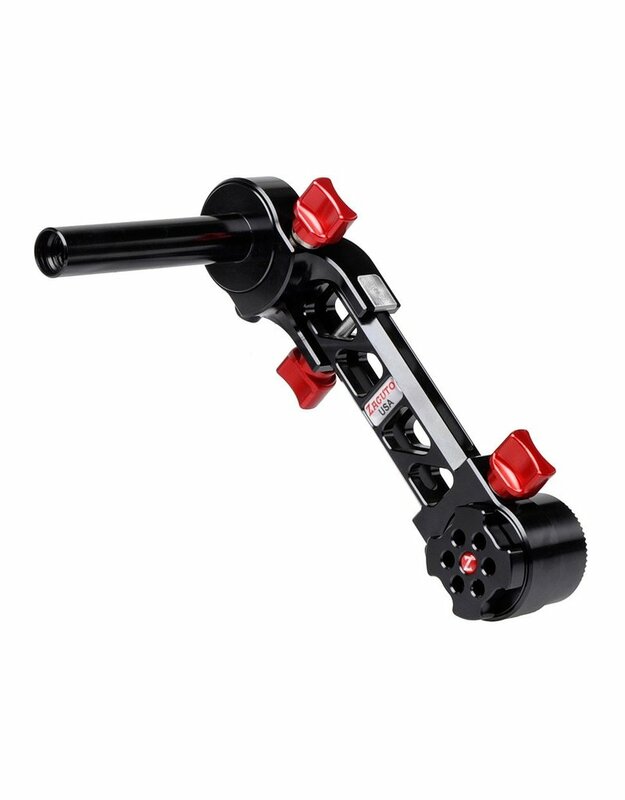 If you are using the Zacuto Recoil handle, the C200 LCD can mount into the coldshoe of the Recoil handle with the addition of the C200 LCD Mount. If the original camera handle is used and mounting of an Axis for a Gratical EVF is needed, it is possible to attach the Z-Rail Axis Mount to the front of your top plate and it will provide a 15 mm quick release rod support to mount the Axis Mini EVF Mount. 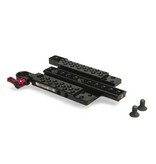 This monitor and viewfinder mount is individually adjustable and has four adjustment points. It is mounted to the rod support of a camera or a top plate with the 15 mm rod and leaves plenty of room to adjust the focus on the lens. 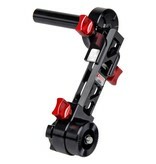 The Axis Mini can basically be mounted on any 15 mm rod support. 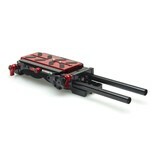 It is suitable for shoulder mounted or tripod operation. All closures are fitted with quick-release screws. 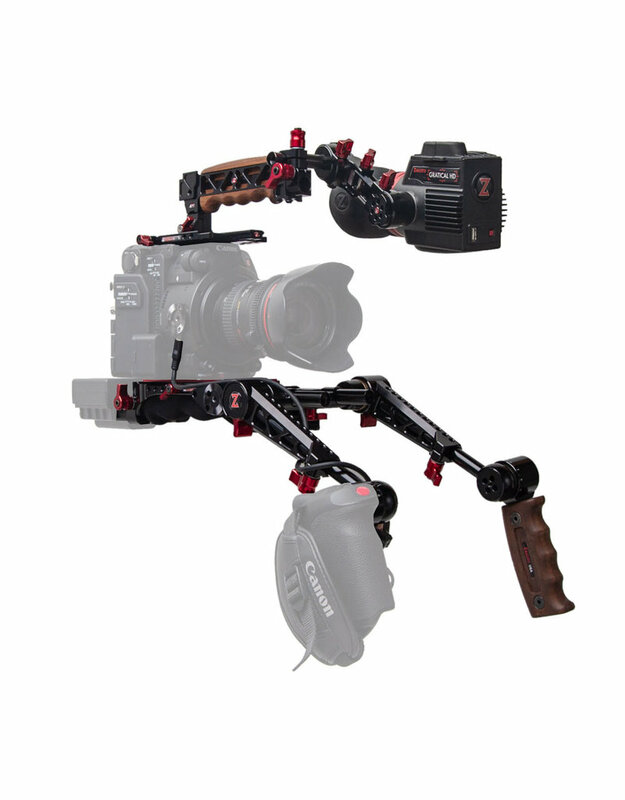 Over two years in the making, Zacuto brought five different engineering companies together to bring this newest EVF concept to life. 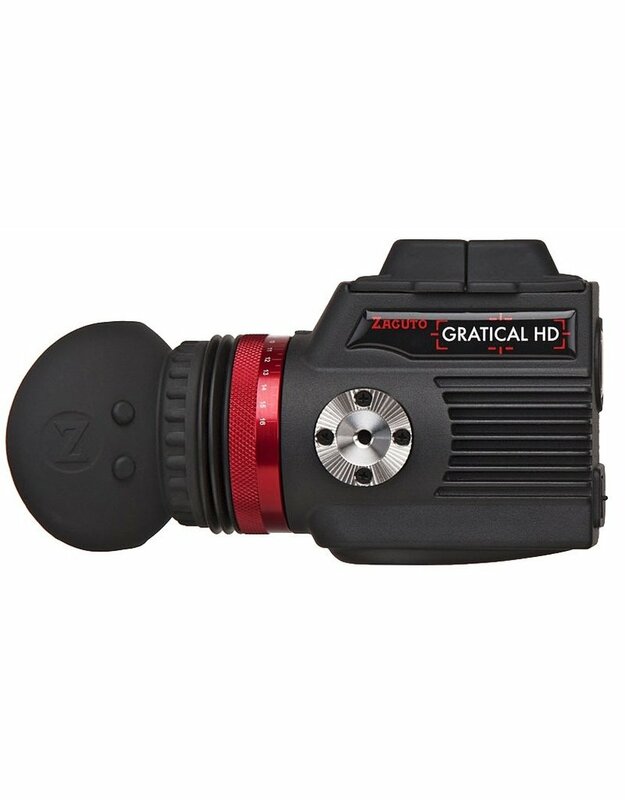 The Gratical HD Micro-OLED electronic viewfinder uses an extremely powerful FPGA dual core processor and the latest Micro-OLED displays to provide a hugely expanded contrast range. Our Micro-OLED display supports high pixel density with unparalleled resolution, true blacks, gamma and contrast range. The Gratical HD has 5.4 million pixels on a 0.61" diagonal screen no bigger than the size of your pinkie fingernail. 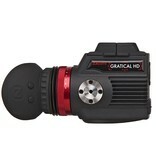 The Gratical HD includes two HDMI and two SDI ports with cross conversion from HDMI to SDI. Weather resistant covers prevent moisture or debris from getting in open ports. You'll be amazed with how sharp the image is. The internal field of view is larger than most of the competition and features a built in -1 to +4 diopter range and Zacuto formula anti-fog coating. Auto-closing eyecup door prevents display sunburn.